Love them or hate them, pig costumes are here and here to stay. As the great Napoleon once famously said, “if you can’t beat ’em, join ’em.” Thanks to those prolific words of wisdom, we can now move on to today’s topic of discussion. Sit down, buckle up and chill out because it’s going to be a wild ride. What do you think of when you think of pigs? Perhaps some ears, a weird nose, curly tail, and bacon sandwiches. Yes, bacon sandwiches. Those are just sandwiches with bacon and nothing else. They exist. Look it up. Anyway, let’s not get off-topic today. Focus. It’s an important day. The grand pig ball is merely hours away and you don’t have a costume! Well, if you are reading this, then you came to the right place. If you’re not reading it, then these words are being wasted because you are not reading it and are somewhere else. For the ones that are still here though, don’t worry. We have the best pig costumes on the interwebs for you to enjoy. We have a long way to go here so let’s start off slowly. Pig costumes are nothing to mess around with so this is going to be a serious list. No goofs and gaffs this time. Just pure, raw, streaky pig talk. 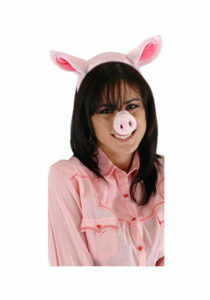 Now, what we have here is just your basic pig costume. There’s a nose, an ear and tail thrown in there for dramatic effect but it’s nothing too crazy. The secret here is not about realism. 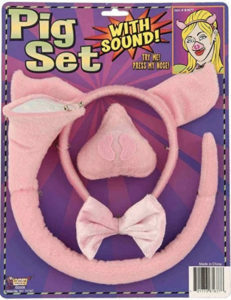 Obviously, this pig costume lacks many key features for the pig purists out there. Hence, if you are a pig purist, then look elsewhere. This is the pig costume for those casual pig lovers. They have a grand pig ball to get to tonight and just want something quick and comfortable that fits all sizes. If this person sounds like you, then check this great, affordable option out. Don’t forget, this costume was made with “love and laughter in the USA.” Seriously, that’s what the designer says. That’s great they put love and laughter into it, but really, we just don’t want it to fall apart. Alright, let’s increase the stakes a little bit here. While the last costume is great (love and laughter included) it was missing one key element. The sensation of sound is a good one. Do you really want to be walking around the grand pig ball “oinking” your heart out? 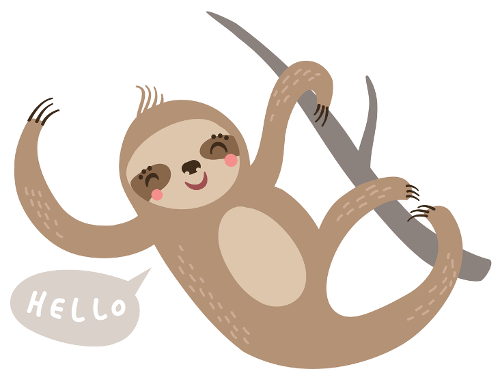 Sure, it might seem cute at first, but there is only so much someone can take of that. Good luck trying to impress your pig crush when your throat is sore from over oinking. Now a dilemma arises. How is one supposed to remain authentic to the pig without making that infamous pig sound? The answer lies within this pig set (with sound). Now you can roam the party, countryside or wherever and let technology take care of the noises for you. After all, isn’t that what technology is for? We are far too advanced as a human race to “oink” by ourselves. Hence, embrace technology with this toy and stay true to your pig roots. The pig party is over. Everyone is sufficiently stuffed on pork products and tired past the point of return. Party goers start dropping like flies. It’s a rather sad sight to see. These once, stupendous costumes are now just piles of sleeping pig people. You don’t want to become like these people right? When the time comes to sleep in the mud with the rest of your pig friends, don’t you want to be prepared? Don’t even answer those questions because the answer is obvious. You want to be prepared. You want to sleep in your pig costume and you want to do it in style. That’s where this pig pajama onesie costume comes in handy. With its polar fleece, you know that you’ll be cuddly and cozy in any situation. Don’t limit this costume to just sleeping though. It’s far too comfortable for that. Bring it to school, work, parties or Auntie Dorothy’s mint jelly competition. Wherever there are people wearing clothes, there is a place for you to wear this costume. Don’t be that person who misses out on this once in a lifetime opportunity. Some people take their pig costumes seriously. They take it so seriously, that they don’t even want to show their faces. There is nothing wrong with these people. We all applaud you for your intense dedication to the pig. We also understand your scenario. Not everyone out there is understanding like this. They may ridicule you for your pig love. They may tease and poke fun. Don’t listen to these people though. They are insignificant. Regardless of that, there is a way to avoid these pig haters altogether. 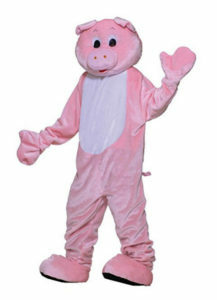 With a deluxe, plus pig mascot costume such as this, you can show off your full appreciation for pigs while remaining completely anonymous. 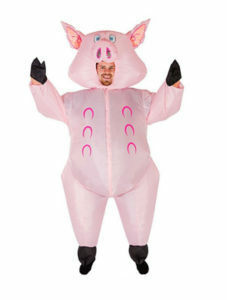 Another positive aspect to this pig costume is the quality. It’s 100% polyester and comes with see-through eye mesh allowing you to observe comfortably. Since this is a professional grade mascot costume, this is ideal for promoting an event, team or business. Pig mascots are few and far between these days, so you might just have a shot at the big time with this one. What’s cuter than a baby in a pig costume? Perhaps a pile of puppies playing in a field with panda bears but that’s not really the point here. 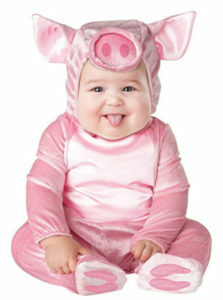 The point is, a baby is cute in a pig costume. There is not denying that. But now you are probably asking why you would even want to put your baby in a pig costume, to begin with? Why?! Why?! Because you can. See, babies cause a lot of stress, pain, and suffering for their parents. When you have a baby, you have to then dedicate your entire life to taking care of that baby forever. The one zone of refuge you have, the one element you can control is their outfit. So, while they are still young, take this time to dress them in all sorts of ridiculous costumes. It will make you laugh and forget how tired you are after all those consecutive, sleepless nights. More importantly, it’s completely machine washable for easy cleaning. Think about it. You are putting a baby in a pig costume. Odds are, they will make a mess. Besides bacon, the pig nose is probably the most iconic part of the pig. Think about all those times you tried to impersonate a pig. Yes, all 273 times. Can you remember the one action you almost always did? It should be a close match between the pig nose and “oink” sound. Pigs have weird noses. That’s just a fact. 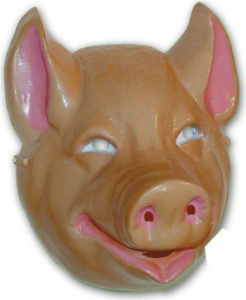 Hence, for those that want to be historically accurate with their pig impersonations, look into this hog snout pig nose. 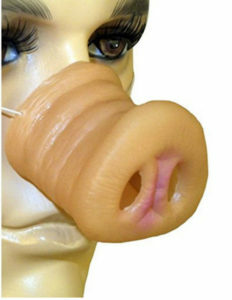 As you can see by this extremely creepy 3D rendering, this pig nose is quite accurate. It has everything you want in a pig nose. It’s got big nostrils, pig wrinkles and even that realistic coloring we all know and love. Essentially, it’s what we all want in a pig nose. Furthermore, it even has a nice strap to keep that baby locked and loaded. Pig play gets rough. The last thing anyone wants is a loose pig nose rolling around the floor. The folks over at Bodysocks strike again. For those unfamiliar with their mastery, it’s time to get acquainted. Bodysocks specialize in making large, inflatable costumes in a variety of exciting fashions. There are birds, clowns, cows, sharks and more. Of course, we are here to only focus on the best one. An inflatable pig costume is quite the experience. You probably didn’t even know you needed one until now. Just look at this thing. It has hoofs and an inflatable stomach. Sometimes, a picture is so great that minimal interpretation is needed. This is one of those times. So sit back, and soak it all in. Just enjoy the pleasure that is this inflatable pig costume. Think how many lives you will influence with this one article alone. You have the power to change the world. Just put on the costume and let it take care of the rest. Why do pig costumes always have to be so cute? Sorry to all the pig lovers out there, but that’s just not realistic. Pigs aren’t always cute. Life isn’t always cute. There is a dark side to every tale and that is especially true for pigs. These dirty, greedy, loud excuses for animals need to be represented accurately sometimes. We can’t always just walk around pretending they are these adorable, little furry animals to cuddle with. No, it’s time to show the world what pigs really are. To do this, put this mask on for starters. By no means is it a pretty mask but that’s alright. The truth isn’t always pretty. It hurts and it stings. That’s the exact feeling one will feel when looking at this mask. Rubie, whoever you are, you deserve a medal. Your costume company designed a terribly frightening mask. Go ahead, pretend that it’s fun for kids and adults alike. Unfortunately, that’s just not true. This mask is downright scary. It looks like the face of a pig that just came back from a 12-hour pig roast. Let’s lighten things up here a bit. That last pig costume was a little dark. Now, it’s time to ease up off the gas pedal and cruise back into comfortable territory. This hat is literally comfortable and aesthetically pleasing. It’s perfect for those “cool” pig fans that want to strut around wearing their pig hats without sacrificing too much style. Going to a wedding? This pig hat won’t disrupt the tux. Basketball game? 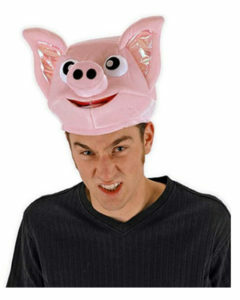 This pig hat is perfect for expressing your team pride. Essentially any event you are attending is ideal for this hat. Enough about that though, let’s dig into the semantics. It might not seem like much, but this pig hat has a secret weapon. Inside the nose, there is a spring that causes the nose to move. Sneaky right? It gets even crazier though. This hat even has a secret pocket for all your secret pig accessories. People are so distracted by how awesome your hat is, they won’t even realize you’re carrying the North Korean nuclear codes under that pink, furry hat of yours. It’s been an incredible adventure with you all but sadly, our pig escapades are coming to a close. Before we depart, let’s examine one of the most functional pig costumes on this very list. Pigs. Hats. Scarfs. Mittens. Throw all those ingredients into a bucket and try your best to combine them all. Most likely, your creation won’t be a good one but that’s ok. That’s what professionals are for. Tonwhar is this professional. They were somehow able to craft a stylish hat that is also a scarf and mittens. 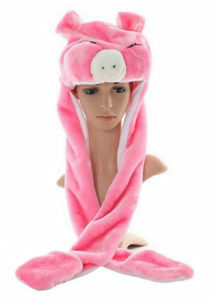 Of course, this hat even looks like a pig, otherwise, it wouldn’t be on this list. So now, all you cold weather pig fans can rejoice in harmony. Now, there is a hat that satisfies every need. No longer do you have to waste precious time digging through your various hats, scarfs, and mittens. Just find the pink, pig hat and go on your way. This hat will save you time and Napolean always says “time is money.” So stop wasting time reading these words and go get some pig stuff.